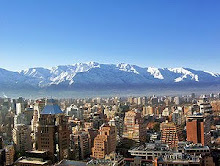 Coming from Fillmore Utah, life in Santiago is certainly a change, but we are adapting quite well I think. The area we are in is called Providencia and is an upscale part of the city full of old mansions that have mostly become businesses much like South Temple in Salt Lake City. Providencia was named for a convent that was originally here, called something like 'Our Lady of Providence.' Many of the older homes here have been removed to build apartments and the skyline is a mass of tall apartments. Almost every apartment has one or more balconies and many of these are full of plants such as bouganvilla. It is just beautiful. There are very few tall businesses and no tall skyscrapers in this part of the city. However, there are several embassies and small universities. Providencia includes many of the best restaurants and finer retail stores in the city. The streets are all tree-lined, with sidewalks which are about 6-15 feet wide. The sidewalks are shared by pedestrians and bicycles alike, which at times is a little dangerous. The main road adjacent to us is paved with what looks like quarried blocks of stone. We have speculated on their age. This area was settled in the late 1800's but when the road was put in, we have no idea. The quaint, cobbled 6-lane road makes for lots of noise from the cars going by. Most of the roads, however are paved with asphalt and most are one way. We live in an 8 story apartment building with four apartments on each level. The lower level is partially enclosed and decorated as an area for entertaining and recreation. We have a guard on duty at all times (not with a sawed off shotgun) who lets us in and out of the gate for security. Crime is not a big problem here but people are very cautious and security is tight everywhere. This is apparently a cultural thing. Here are some photos of our apartment from the street, the foyer of the apartment and our spare bedroom while we were trying to unpack and other rooms in our apartment. We find the place very comfortable. . The day I taught my first piano lesson, I found that both the parking lot to the Area Office and to the church parking lot were both closed and locked. These are just across from our apartment and a convenient way to enter the Temple block which includes the Temple, chapel, Area office and MTC. I walked around to the Area Office and a Guard let me in through the big metal gate outside. From there I went around to the chapel but the gate to it was locked. I went over to the MTC, which is also the apartment for all the temple missioanries and the Temple President, and all doors were locked. This was a Sunday afternoon. I felt like a prisoner and had a tough time figuring out how I was going to solve the problem. However, I was saved by a piano student's brother who came with a key to the parking lot and the church. In Fillmore, I seldom lock anything so this is a big adjustment for me. There is quite a bit of interest in the keyboard program. I have eight piano students at this time. I teach two students at a time. On Sunday I teach in the church and on Wed. I teach in the MTC which has a beautiful meeting room and a very nice piano. I have been asked to accompany for the ward choir which has about 25 members in it. We are keeping very busy with the medical aspects of our calling. How fun it is to interact with the missionaries with their bright smiles and enthusiasm for the work, whether they are sick or not. I think our Spanish is improving daily and we can put sentences together pretty well. Now, having said that, understanding the Chilenos is an entirely different thing. We both still really struggle unless we are fortunate enough to be talking to someone who understands the necessity of speaking slowly and separating their words. I have found, however, that if I am speaking to someone from Central America, I understand them much better. Chilean Spanish is quite different from that spoken closer to the US. Frequently they refer to it here as Castilian rather than Spanish. We became aware of a husband/wife doctor team who are very active LDS with 7 children. We made an appointment with them and had a most wonderful visit. On Tuesday we bought a car, a Mazda wagon, from a couple from Tucson who were leaving. They happen to be good friends with Dave's cousin Maren McRae and her husband Burr. We hated to see them go but we are excited about the car. Tomorrow we are going to try navigating the roads of this city and go shopping. Here is a shot of the Jumbo store I took while shopping--with its. 54 checkout stands. AS usual, is a pleasure to read about your life in Chile. Please, keep posting! Do take care and may God bless you and Dr. Limburg.